You must see the Taj Mahal at least once in your lifetime–to feel the cool white marble, see the intricate inlay work and awe-inspiring architecture, to smell the fragrant gardens, to know the meaning of true love. Well, the Taj Mahal is more accessible than you think! Only a short drive from India’s captial of New Delhi, the Taj Mahal, along with Agra’s other monuments and sites, becomes a memorable addition to any vacation. 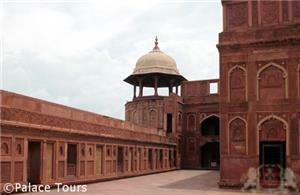 India Tours will arrange transportation, guides, and lodging for your trip from Delhi to Agra. Your chauffeur greets you at your hotel in Delhi this morning. A luxury car, stocked with plenty of amenities to add comfort to your journey, awaits to drive you from Delhi to Agra (about 4 hours). 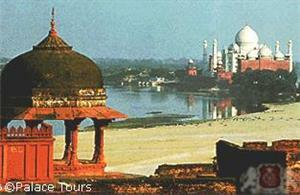 Upon arrival in Agra, transfer to a luxury hotel for lunch (guests’ own account) to revive and refresh and then proceed to the Taj Mahal. Arrive at the Taj Mahal where your knowledgeable guide is ready to tell you the magnificent history behind this Wonder of the World. You have time to stroll through the gardens, sit on the steps and absorb these fabulous surroundings to your heart’s content. Depart the Taj Mahal and take a half day tour of Agra, visiting the Agra Fort and the city bazaar before returning to the hotel for your overnight stay. 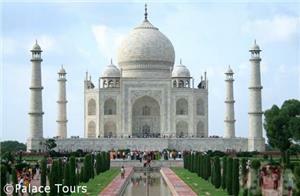 Early this morning, enjoy an unforgettable sunrise visit to the Taj Mahal. Return to the hotel for breakfast before departing by road back to Delhi, visiting Fatehpur Sikri en route. This now-abandoned palatial complex was once a majestic fortress and served as the capital of the Mughal Empire under Emperor Akbar. Your local guide shares his/her knowledge with you to explain its rise and downfall. 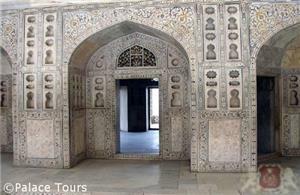 Upon arrival in Delhi, transfer to your hotel or to the airport for your onward journey.